Smart has revealed its smart vision EQ fortwo concept, which shows the carmaker’s ideas for how electric and autonomous technology could unite in the future to bring an urban car sharing solution. Making its debut at this month’s Frankfurt Motor Show, the concept follows Mercedes’ announcement last year that it will launch an entire family of electric vehicles under its EQ sub-brand, as well as parent firm Daimler’s plans to more than 10 new electric cars into series production by 2022, from the Smart to the large SUV. Mercedes-Benz is also launching a diesel PHEV next year. 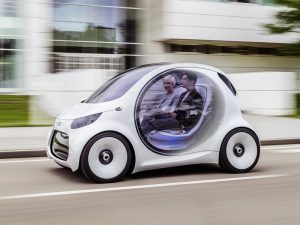 Bearing a similar length to the current smart fortwo but slightly wider and lower, the two-seater smart vision EQ fortwo concept has been developed under the ‘CASE’ corporate strategy, built on the strategic pillars of connectivity (Connected), autonomous driving (Autonomous), flexible use (Shared & Services) and electric drive systems (Electric). Targeted for car sharing – Daimler says a vehicle from its car2go subsidiary is hired somewhere in the world every 1.4 seconds – the concept uses “swarm intelligence” and autonomous driving to pick up passengers rather than requiring users to search for a car. It also features an electric drive with a rechargeable lithium-ion battery with a capacity of 30 kWh. When not in use, the car automatically makes its way back to a charging station. It can also provide power back to the grid through inductive docking, acting as a “swarm battery”.